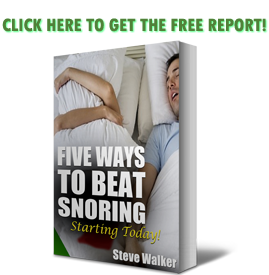 Many of us who snore and have tried to do something about it are always on the lookout for other ways to try and remedy the situation. I find that the most effective way is with a mandibular adjustment device (MAD). That being said, I like to try different products just to see if one is more effective or easier to use than other devices that I have used. 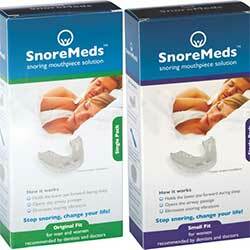 A device that I thought I needed to try was the SnoreMeds anti-snoring mouthpiece. It is a MAD but one that allows some adjustment to suit individual mouths and jaws. If you have tried to use MADS before but have found them uncomfortable or not very effective, try the SnoreMeds device. The adjustment could well answer your problems. A Word Of Caution First! A quick word of warning before you order. If you are like me, once you have decided to buy something, you look on the internet to see if you can get it cheaper elsewhere. Be wary when looking for something cheap that will be in your mouth for about 8 hours every night. There are many similar looking items available on several sites, often from China. There is no way of knowing what these MADs are actually made of. The SnoreMeds device is certified 100% BPA and latex free and uses FDA certified plastics suitable for medical dental use. Cheaper doesn’t necessarily mean better. On their website SnoreMeds does mention a number of conditions where their device is unsuitable (although the same advice applies to all MADs). You need to look at all areas of the site to find a list, but they do miss some conditions where a MAD is also unsuitable. These include jaw problems, lung conditions or teeth implants. If you have any condition that is related to your mouth or breathing it is worthwhile speaking to your doctor or dentist before you try any MAD. The SnoreMeds device is available in two sizes, regular and small. The regular is usually more suited to men and the small usually more suited to women. However, it all depends on your individual mouth shape and size, so think about that before you order. SnoreMeds say that their device will last about four months depending on the individual. They offer quite substantial discounts for ordering a pack of two or four mouthpieces in one go. They also offer a money back guarantee, but this is only applicable for orders of a single mouthpiece. Many MAD companies offer a 30 day money back guarantee, but SnoreMeds offers a 45 day guarantee. Personally I think that this is more of a marketing ploy than anything else. You will know within a week or so whether it is effective or not. What do you receive in the box? Well, there is the SnoreMeds mouthpiece, a spatula and an antibacterial storage case. 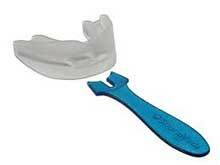 Before the mouthpiece can be used it needs to be molded to your specific mouth shape. There are complete instructions on how to do this, plus videos on the SnoreMeds website. But in brief it suggests that you practice getting a position where your lower jaw is 3 to 5 mm (about a 1/16 to 1/8 of an inch) in front of your upper jaw, heat the mouthpiece in boiled water, fit it to the mouth with your jaw adjusted as mentioned and bite into the now soft plastic. How Well Did it Work for Me? So how did I get on with my trial of the SnoreMeds mouthpiece? Adjusting it to fit was quite straightforward; remembering to make sure it is the correct way up. Watching the short video on the molding instructions page is very helpful. Although it is not the best advice to pour boiling water straight in to a standard glass as it may crack it; a cup or mug would be better. So, mouthpiece molded, I tried it for the night. One part of the SnoreMeds mouthpiece that I like is the fact that it features two breathing slots in its design, allowing you to breathe through your mouth with the device fitted. Not as good as ZQuiet’s living hinge, of course, but not as rigid as the SnoreRX’s precise construction. I am one of those people who feel a little uncomfortable if I can’t breathe through my mouth. SnoreMeds says that it can take a week to get used to their device and although I had no problems getting used to it, as I have used various MADs for quite a while, I did when I first started using one. But if you have problems like finding it on the pillow next to you or excessive salivation, stick with it for a while and it should work itself out. If it doesn’t, a Tongue retainer like the Good Morning Snore Solution should help. When I first used MADs I found the best way to get used to them was to wear them while reading before bed. That way it was there and I almost forgot about it as I was dropping off. Did it work? Well for me my gauge on the effectiveness on any anti-snoring device that I try is how many bruises from my wife’s elbow I wake up with (I joke!). With the SnoreMeds mouthpiece in place my wife didn’t have to nudge me, so it worked very effectively for me from the first night. When I brushed my teeth in the morning I cleaned the device and put it in the supplied antibacterial case for the day. Later that night, I just gave it a quick rinse in cold water before putting it in my mouth for the night. So to sum up, I found the SnoreMeds anti-snoring device effective, easy to use and get used to, as well as being reasonably priced. 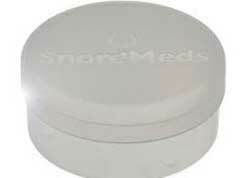 What If The SnoreMeds Anti-Snoring Device Doesn’t Work for You? It will probably not be suitable for everyone; it is common with any MAD to be effective in about 85% of cases. If the SnoreMeds device does not work for you then you can take advantage of the money back guarantee. From my point of view the SnoreMeds device is well worth trying. You will be surprised at how something so small and inexpensive can improve your life.